Finding the perfect outfit to ace an interview for a potential dream job is a difficult task to face. Not only do students often have few professional options in their closets — considering typical class attire is likely a t-shirt and shorts — but also the majority of students might not have the funding needed to pick out that killer power suit. 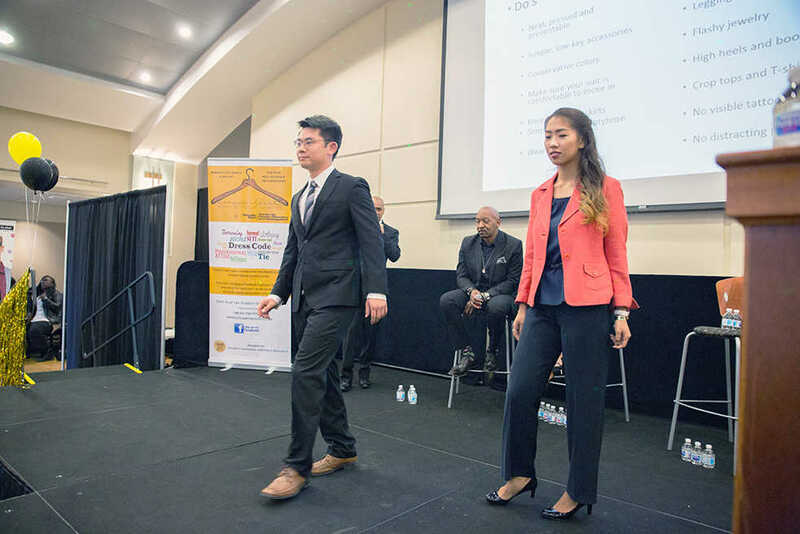 Tech offers a resource called Campus Closet, which provides students with the options and assistance they need to dress their best for job interviews, career fairs and other similar events. Campus Closet allows all Tech students to check out clothing free of charge, and the program is run solely through donations. This program officially opened for the year on Sept. 4, and is located on the basement level of the Bill Moore Student Success Center. They are open Monday to Friday during the late hours of the afternoon — full hours and more information can be found at campuscloset.gatech.edu. The procedure to participate in the program is fairly simple: create a Campus Closet account, check out your outfit of choice, wear the outfit to an interview or business event, dry-clean the garment after use, and return the garments to Campus Closet free of charge. If desired, students are also given the option to accessorize their rented attire with a Georgia Tech pin and leather portfolio. Students may rent the business attire for up to two weeks, and must return the garment with a proof of dry-cleaning even if the piece went unworn. The Campus Closet wants students to not only be dressed appropriately, but dressed well. Their official website includes information on men’s and women’s sizing charts and even provides a sizing video for reference. In addition to sizing help, they have a map of Atlanta with the nearest dry-cleaning locations. If you chose to get your garment dry-cleaned near Georgia Tech’s campus, some locations will offer a student discount. In addition, the Campus Closet program hosts events, both on and off campus. Earlier this semester, the program hosted a Clothing Giveaway Day, in which items from the Campus Closet were given away completely free of cost for students to keep permanently. The program is hosting a variety of other free events like this for students to attend throughout the semester. For students who are not in need of the rental services and want to give back to their fellow job-seekers, the program is always looking to accept donations of gently-used clothing, which can be dropped off at either the Bill Moore Student Success Center, Scheller College of Business Suite 322, or the Georgia Tech Hotel. Monetary donations allow the program to properly allocate funds to their most relevant needs. The program welcomes the idea of donating vouchers as well; specifically vouchers for dry-cleaning or salon and grooming. A good business suit can help students make the right impression at job fairs and interviews. Whether students want to get involved by taking full advantage of the Campus Closet or simply by making a donation, this program aims to be a valuable resource for Tech students.